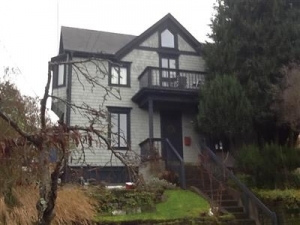 For people who arrived in Seattle and were able to buy their houses a long time ago, like say after the Boeing “Lights Out” Bust of 1968-1971, bargains abounded. Many of those people are seniors by now, and are house rich and cash poor. The value of their houses is mostly in the land. Some don’t have the means or access to loans to renovate or spend $100-150K+ on a mother-in-law apartment or $200-350K on a backyard cottage, but still want to stay in the neighborhood, connected to friends. Current zoning in single-family zones doesn’t allow anything but a single-family home and one additional accessory dwelling. 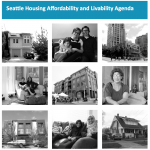 (Efforts to allow more have been stalled by a lawsuit from Queen Anne Community Council.) At this point, most people who age out of their single-family home must leave their community. Displacement also occurs when an appropriate type of housing is not available. At the same time, in Seattle rising home values have made most all single-family homes out of reach to anyone who hasn’t been invested for years already, or isn’t rich. This hits younger people, new people moving to Seattle, and people of color especially hard, as this article in Politico makes clear. These are problems. Here’s one possible solution: Let’s say a group of people who’ve known each other for years live in single-family homes. They don’t even need to live on the same block or in the same neighborhood. They’ve got a lot of equity, but renovating their homes doesn’t make a lot of sense for aging in place, and it’s too much space anyway. They could get together and form a small cooperative, similar to a Baugruppen. They would put the land under their single-family houses into a land trust, and sell the houses on their parcels to new owners, retaining one or two parcels for their new building, which would also become part the land trust. Or, rather than creating a land trust, they could establish a ground lease for the land under their houses, or they could sell the houses outright. The structure of ownership could adapt to the circumstances of the owners. Those who have family members in mind to occupy their old houses might favor a land trust model, for example. A City-sponsored bank, or a commercial bank program with a City guarantee, would leverage the old owners’ equity toward a loan for building a new multiplex designed with universal design features. (This is the only “public” part of this idea.) The land trust or ground lease payments would go toward paying the mortgage on the new building, and with an ultra-low energy building, those payments might be enough to cover the old owners’ utilities and maintenance in their new Passivhaus building. The old neighbors have used their equity to create an accessible, comfortable place to age in place, with people they have known for years. (No reason neighbors of any age or length of residency who’d like to downsize and share housing couldn’t use this model too.) But the benefits accrue to more than just the old friends. Since the new neighbors purchasing the existing houses are now financing just the “improvement value,” and not the land, their mortgages are lower. The new owners could live in the houses as they were, renovate them, or demo them and build new as they saw fit. (Or, the old owners could put covenants on the houses that would prevent demolition of the homes while they were alive, or establish income limits, or special setbacks, or whatever they chose, though some covenants could lower the value and/or make it more difficult to get financing.) Using a small portion of its bonding capacity, the City could provide low-interest public financing to help make this happen all over Seattle. The City could also provide the technical/legal expertise to set up the land trusts and possibly to administer the trusts, although there are excellent organizations that already do this, like Homestead Community Land Trust. I’ve vetted this idea with Kathleen Hosfeld, Executive Director of Homestead, and with some caveats she thinks it could be done. 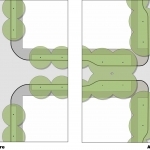 Thanks also to Richard Conlin for suggesting that like congregate houses now, these ownership and living arrangements could be granted special exceptions from single-family zoning restrictions without changing the underlying zoning. If they wanted to and they were on the same block, both new and old neighbors could combine their back yards, like we did in the housing cooperative I lived in in Toronto when I was in architecture school. I’ve been doodling a three- or four-story elevator building with shared living room/dining room/kitchen/study and a guest or caregiver suite on the ground floor, and apartments on each of the floors above. It uses a traditional layout, and so is amenable to a number of different floor configurations and combinations of apartments, accommodating studios to two or three-bedroom apartments. It fits on one 5,000 ft2 standard Seattle lot. It meets current single-family zone development standards in terms of height, setbacks, and lot coverage. 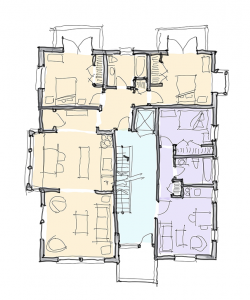 With a fourth floor (a 40′ height limit, possibly granted with meeting Passivhaus or Living Building Challenge), or a bit more lot coverage allowance, it could be a six- or eight-plex and still fit on one 5,000 ft2 lot. If say six or eight households got together and sold six of the houses and used two of their 5,000 ft2 lots for the site of the new building there are many many additional configurations that would work. I think this idea dovetails nicely with Passivhaus colleague Mike Eliason’s “Affordable housing via a cooperative overlay in Seattle’s single family zones” and friend Zach Lubarsky’s recent thoughts on “Social Housing“. 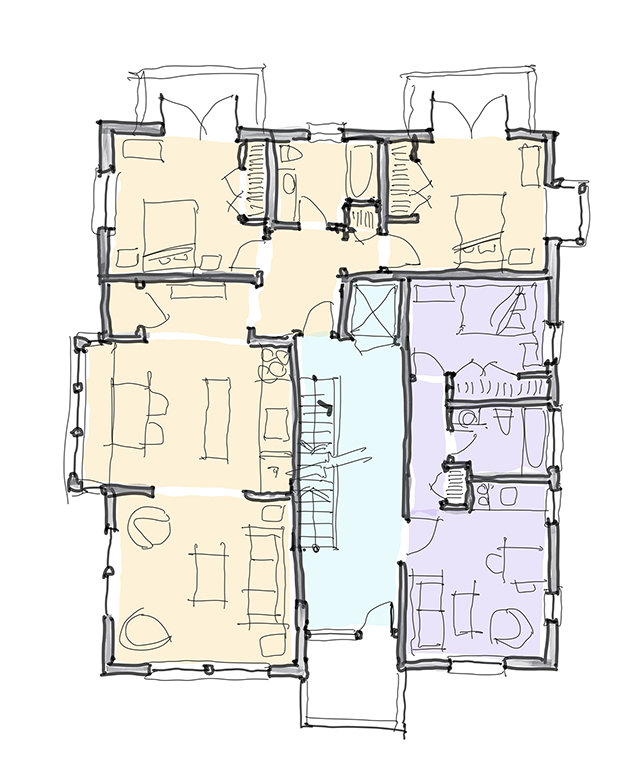 Passivplex – Main Floor. 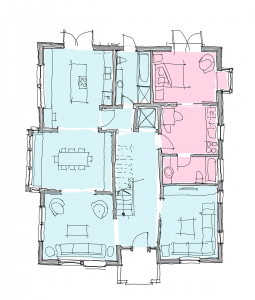 Blue is shared space, pink is a caretaker or guest suite. 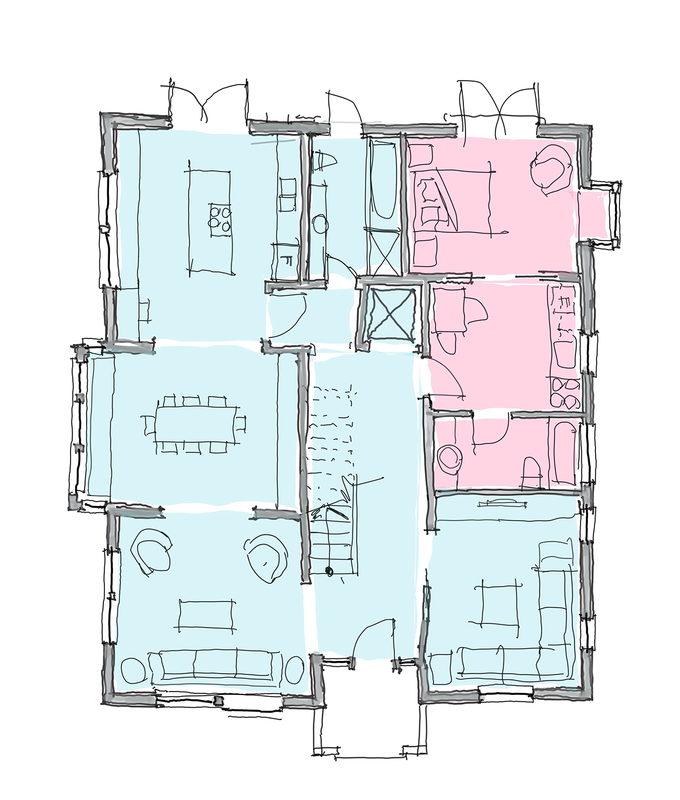 Passivplex – Second Floor. Gold is a two-bedroom, purple is a one-bedroom. Many configurations are possible. What do you think? Could you get four neighbors together to do this? Six? I’ve disabled comments on my blog because of spam, but please send me feedback. I’ll publish a follow-up post with your good ideas. Note that adjusting single-family zoning to allow these kinds of buildings is a prerequisite to anything like this happening. If you like the idea, share this post with friends, and contact Seattle City Council and request that they lay the groundwork.